The wild orangutan population is estimated to be 66,000, with about 80 to 90 percent of them in Indonesia . Today an estimated 45,000 to 55,000 orangutans live in Borneo, with another 6,000 to 10,000 in Sumatra. About half the orangutans that live on Borneo live peat-swamp forests in Central Kalimantan and the forest in East Kalimantan and Sabah. In the old days orangutans could range across the entire island of Borneo but today most live in small, scattered populations. Orangutan populations have declined primarily as a result of poaching and loss of habitat, much of it a result of palm oil plantations and illegal logging. As well as forest clearing, they are threatened by commercial logging, hunting and poaching for the bush meat and pet trades and forest fires. Orangutans are slow to recover because they have a slow rate of reproduction. In Sumatra, only 13 isolated clusters of orangutans remain. At the current rate of decline, experts estimate that the number will drop by half over the next decade. With its slow rate of reproduction and the continuing habitat destruction, the species has little chance of surviving outside well-protected reserves and zoos. Some have said that at the current of habitat destruction, orangutans could be extinct in the wild in 10 to 20 years. The WWF in Malaysia however has downplayed fears that orangutans could be extinct within the next few decades due to habitat destruction, describing those claims as “rather alarmist and not realistic”. There are 30 percent less orangutans than there were in the 1980s. As recently as 1900, more than 300,000 orangutans roamed freely across the jungles of Southeast Asia and southern China A few decades ago there were still hundreds of thousands of them. In the early 2000s it was said there were around 15,000 to 24,000 orangutans are left in the wild. The number was upped to around 40,000 after studies in 2004. A new population with several thousand members was discovered in Kalimantan. There are about 1,000 in captivity. 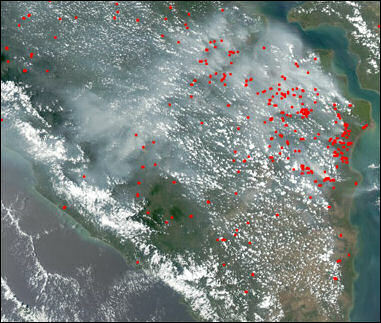 Fires in Sumatra Habitat loss is regarded as the No. 1 factor in the decline of orangutan populations. Orangutan habitats have been lost to legal and illegal logging, the encroachment of farmers in search of new crop land, and the clearing of forest for palm oil or rubber plantations. According to some estimates the natural range of orangutans has shrunk 90 percent in the last half of the 20th century and 80 percent of that in the last 20 years. Indonesia’s transmigration has consumed large chunks of orangutan habitat. In 1995, Jakarta proposed transforming 1 million acres of prime orangutan habitat in the peat-swamp forest into a huge rice plantation farmed by tens of thousands transmigrants. In Borneo swampland areas that orangutans are found in are also coveted by the palm oil barons. 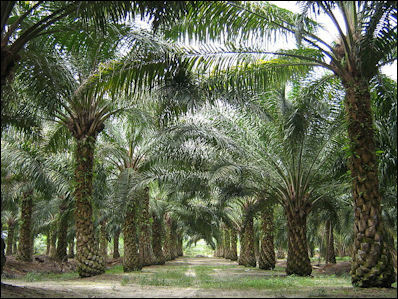 To grow oil palm (Elaesis guineensis) in a peat swamp forest, workers typically drain the land, chop down the trees (which are sold for timber) and burn what's left. It's a procedure, Galdikas says, that not only has killed or displaced thousands of orangutans but also has triggered massive fires and sent huge amounts of carbon dioxide into the air, furthering climate change. “The 6,000 remaining orangutans in Tanjung Puting can no longer travel at will because of palm oil plantations surrounding the park, all created since 1971. When she began the study, she says, "orangutans could wander to the other side of Borneo if they felt like it. Now they're trapped. They get lost in these palm oil plantations and they get killed." The pledge came after wildlife groups and government officials held a meeting about orang-utan conservation. The groups urged authorities to establish protected zones of at least 110 yards (100m) wide on each side of a river so animals can move between forest areas. Activists say Sabah's orang-utans, pygmy elephants, rhinoceroses, sun bears and other wildlife are at risk because their jungle habitats are increasingly being taken over by plantations. Some plantation operators have long flouted the law by expanding their crops to the edge of rivers, but officials plan to crack down on such actions and get the businesses to replant trees which have been cut down near rivers, Masidi told The Associated Press. "We accept the fact that it will be a gigantic effort," Mr Masidi said. Marc Ancrenaz, co-founder of French-based conservation group Hutan, said laws should also be amended to ensure that protected areas are properly managed. "It's a major project," he said. "At the end of the day... there is no other way." Hutan estimates there are fewer than 11,000 orang-utans remaining in Sabah. There were up to eight times that number 15 years ago. Because getting orangutans to breed in captivity is difficult most captive orangutans have been captured in the wild, often illegally by poachers who kill the mother to obtain the babies, which are more sought after and easier to sell than adults. Orangutan poaching is a serious problem in Borneo. Dyak tribesman, a group of former headhunters, kill the slow-moving and easy-to-shoot mothers and take their babies. Sometimes the babies are shot accidently or die when they fall with their mothers to the ground. Sometimes the mothers are eaten. Sometimes they are left to rot. Sometimes the skulls are removed and decorated with carvings and a coat of shoe polish. Tourist shops sell them for about US$75 a piece. There are also stories of baby orangutans that wake up screaming at night from nightmares after witnessing their mothers being killed by poachers and skinned and eaten in front of them years before. Orangutans have been captured by felling trees or chasing them with dogs to corner them and catch them with nets. Cornered male orangutan have bitten off the hands and feet of humans hunters with their powerful jaws. Orangutan orphans are sold for US$80 to $200 each by hunters and villagers to middlemen, who offer them as pets to wealthy Indonesians or Chinese in Jakarta or smuggle then to Thailand where they are sold to rich Thais, Taiwanese or people from other countries. Young orangutans sell for up to $55,000 on the black market in Thailand and Taiwan. They are often transported out of Indonesia ports by sailors and sold through dealers in Bangkok and Taipei. Orphaned babies are kept in cages or on leashes while they are being transported. Some are kept in horrid conditions. In Bangkok, one was found frozen to death in a cooling container at an animal trafficker’s house. According to some estimates only one orangutan in five that has been shipped overseas survives the journey. Orangutans are protected by the Convention of International Trade in Endangered Species of Flora and Fauna (CITES) act. Malaysia and Indonesia now have stiff penalties for illegally selling , keeping or smuggling orangutans. Laws designed to protect orangutan are only now starting to be enforced. There is strong resistance to helping orangutans. Willie Smots, a British oilmen who has tried to combat orangutan poaching, has had his life threatened, three of his dogs killed and a house set on fire with his wife and children inside. Orangutans have also suffered as a result of the fires that periodically hit Sumatra and Borneo. During the 1997 El Niño drought, approximately 25 million acres, an area about half the size of Oklahoma, burned in Indonesia. Thousands of orangutans died. In Indonesia, orangutans were slaughtered by farmers and plantation workers as they fled the fires and smoke. At least 120 orangutans were killed and 60 young were taken in Central Kalimantan alone. The fires and smoke also burned leaves and stunted the growth of jungle fruits that orangutans rely on for food. Many baby orangutans were too weak to cling to their mothers fell and died. An orangutan rescue operation saved 200 orangutans, many were youngsters claimed by villagers who hoped to sell them for food. Many orangutans driven out of the forests by the fires entered villages and gardens in search of food. Describing the fate of orangutans in village near Palangkaraya in Central Kalimantan, Ron Moreaeu wrote in Time, "Barking dogs had alerted the villagers to the presence of the animals. As the dogs attacked, farmers wielding machetes and sharpened sticks hacked and stabbed the mother to death. The babies were taken captive---to be sold...The dead mothers were skinned and eaten." One wildlife specialist told the New York Times, "It's very scary. They come into the villages and rarely can find any trees, so they just lie on the ground. They invade people's gardens and plantations. People are scared to death of see those wild beasts, so they kill them, particularly the adults. They kill the mothers and steal the babies." The year 2006 was a bad one for drought and fire on Borneo. Willie Smits of the Borneo Orangutan Survival Foundation estimated that 1,000 orangutans died as a result of drought and illegal wildfires on the island. He said, “Orangutans are starving. They are sick, and many of those we are treating were injured after being attacked by machetes.” He also reported that many orangutans were suffering from respiratory distress caused by breathing in smoky haze from the fires.